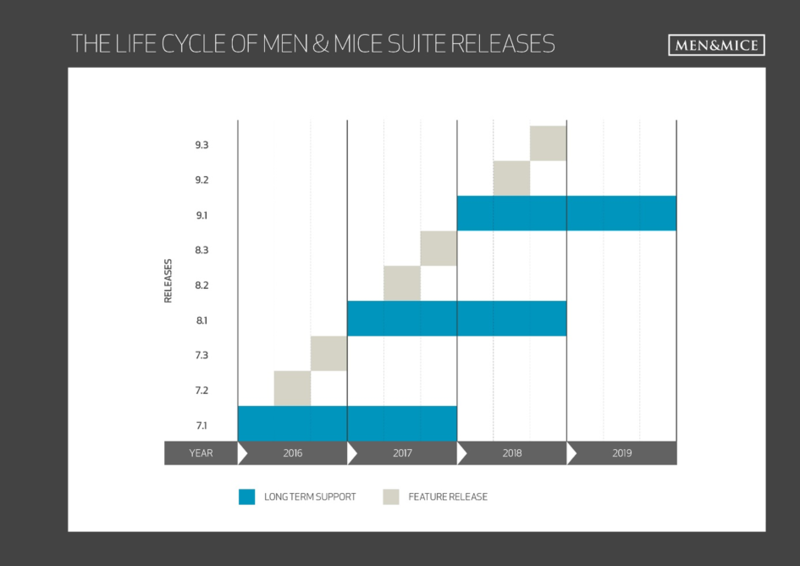 It’s January, so it must be time for the annual Men & Mice Suite LTS release, aka long term support release. A version upgrade of the Men & Mice Suite is scheduled for release three times a year. The versions are differentiated as Long Term Support (LTS) releases, and feature releases. The first release in January of every year is an LTS release. By LTS we mean this version will be supported for two years after its initial release date. The two feature releases have a shorter support cycle. While the primary focus of the feature releases is to introduce new functionality and features, the primary focus of the LTS releases is to fine-tune and improve newly introduced features, as well as to improve the stability and performance of the Men & Mice Suite in general. We like to see our annual LTS release as the prime example of our commitment to quality, superior functionality and keeping our solution as fast, simple and stable as our customers have become accustomed to. To have a peek at what good features found their way into the Suite in 2016 and are fine-tuned in Version 8.1, check out details on our Windows Server 2016 support, REST API and VMware plug-in here. If you want to sink your teeth into the REST API, read our detailed article on the subject. And if you’re curious about support for ISC Kea DHCP and Windows Server 2016 Response Rate Limiting, look no further than here. Finally, read more on how Men & Mice also made inroads into the cloud in 2016 with support for Azure DNS, developed in close cooperation with the Microsoft Azure Team. One brand new tidbit added to 8.1. is a beautiful new look to the console. A new, fresher font and some easy-to-follow icons are sure to make the superior Men & Mice Suite ergonomic experience all that much more visually pleasing. Enjoy! All further information on Men & Mice Suite Version 8.1 is obtainable from the Documentation Release Notes. If you’d like to meet up with Men & Mice in person, please come and visit us at Booth E54 at Cisco Live Berlin at the end of February. If you can’t make it to Berlin, let Men & Mice come to you - sign up for the Bind 9 Logging Best Practices webinar on February 2nd!